Small ship cruising is attracting a growing number of clients as more and more Australians fall in love with its intimate yet adventurous cruise style, according to award winning cruise operator APT. APT’s new Small Ships – Exploring the World 2016 brochure showcases a choice of 24 fully all-inclusive small ship cruise holidays to a range of exotic and inspirational destinations, including the Mediterranean, Northern Europe, Asia, the Kimberley and Antarctica. New features for 2016 include a new itinerary and three new extended cruise and land combinations. In response to demand for cruising the Japanese coastline APT has added an exciting new itinerary, the 15-day Sailing the Japanese Isles is priced from $9,995 per person, twin share, and sails from Osaka to Manila. In a discovery of Japanese culture and heritage, guests will learn about the many age-old traditions, explore some of Asia’s most pristine archipelagos that are only accessible by small ship and enjoy some of the best snorkeling in the world in the Philippines. 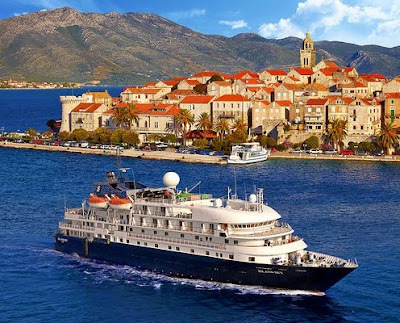 - 23-day Italian Sojourn with Adriatic & Aegean Odyssey – guests enjoy a six night land journey including Rome, Florence and Venice prior to boarding 14-night Boutique Collection Cruise from Venice to Istanbul, sailing the coastlines of Croatia, Montenegro, Greece and Turkey aboard APT’s MS Island Sky. Guests then spend two nights in Istanbul post-cruise. - 34-day Ultimate Britain & Ireland Adventure - APT combines an indepth 22-day land tour of England, Scotland and Ireland with an 11-night coastal cruise of the British Isles, including Western Scotland, aboard APT’s latest new small ship, the newly refurbished MS Hebridean Sky. Highlights include staying at 5-star Scottish Mansion, Cameron House; exploring wild and uninhabited islands with dramatic coastlines; and exploring Ireland’s capital and some of its many castles. - 20-day Scandinavian Wonders & Majestic Norwegian Fjords – A seven night land journey of Denmark, Sweden and Norway precedes a twelve night cruise from Tromso to Leith aboard the MS Hebridean Sky, sailing the Norwegian coastline and its stunning Fjords. Highlights include a private tour of Stockholm’s Vasa Ship Museum, with a special dinner in the museum’s Ship Hall; the chance to travel on the scenic Flåm Railway and in Bergen, enjoy a private recital of Edvard Grieg’s masterpieces. Guests can choose from two distinct cruise styles - Boutique Collection Cruising which will focus on a particular region or a theme; and Expedition Collection Cruising, whereby guests are taken off the beaten track by APT’s ten-strong Expedition Team of expert guides and lecturers, led by an Expedition Leader. All cruises sail aboard one of APT’s own fleet of three ‘Sky’ ships, the MS Caledonian Sky, the MS Island Sky and the MS Hebridean Sky and include all tailor made, handpicked shore excursions with local guides. The APT fleet is unique in that each vessel carries just 114 guests, all of who stay in elegant suites with outside views; and due to the size of each ship, they can dock in ports inaccessible to larger vessels. Onboard features include a library, sun deck, alfresco dining restaurant, beauty salon and ten Zodiacs that enable all guests onExpedition Collection Cruises to travel off the ship to shore together. APT’s Small Ship Cruises are fully all inclusive, offering complimentary beverages available all day while onboard as well as meals, sightseeing and free Wi-Fi in cabins within one price. Four SuperDeals are on offer in the new APT Small Ships 2016 brochure. A ‘Fly Free – including Taxes’, ‘Fly Free, just pay taxes of $950 per person’, ‘Companion Fly Free’ and ‘Airfare Credit’. In addition, APT is introducing a new Early Payment Discount whereby guests will save $1,000 per couple when they book and pay for their cruise 10 months prior to departure. APT is also offering a new Travel with Friends & Save offer – guests who travel with five friends on the same date will save $500 per person. Both new offers are combinable with all APT SuperDeals, which are valid until 31 October 2015. See your local travel agent, call APT on 1300 196 420 or visit aptouring.com.au for further information. *Price is inclusive of APT’s new Early Payment Discount.